UAP-AC is end of life (EOL). Ubiquiti recommends UAP-AC-PRO for direct replacement. 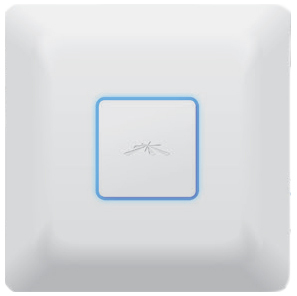 The UniFi AP uses a clean industrial design that seamlessly blends into typical environments. The AP's are feature the latest in WiFi 802.11n MIMO technology. All accessories are included to mount the devices either on the wall or ceilings. Also included is Power Over Ethernet (POE) functionality which allows both power and data to be carried over a single Ethernet cable to the device. At the front-center of the device is a status LED ring which can provide the administrator with location tracking and alerts for each device. UniFi Access Points feature the latest in WiFi 802.11ac MIMO technology -- capable of 1300Mbps speeds with ranges up to 400 ft.